but global wheat consumption will remain at last year's record high level. Export sales of soft white wheat are up 42 percent year to date, a U.S. Wheat Associates market analyst says, but prices continue to lag the five-year average. The higher volume, 3 million metric tons, is accompanied by low prices, said Stephanie Bryant-Erdmann, market analyst for U.S. Wheat Associates. The average export price for 10.5 maximum protein soft white wheat as of Sept. 7 is $203 per metric ton, up 1 percent from last year but 24 percent below the five-year average. Soft white wheat is primarily grown in the Pacific Northwest. The average export price for 12 percent protein hard red winter wheat from the Pacific Northwest is $238 per metric ton, up 9 percent from 2016-2017 but 15 percent below the five-year average. Dark northern spring wheat with 14 percent protein from the region has averaged $303 per metric ton, up 20 percent from 2016-2017 but 1 percent below the five-year average. The top five buyers of soft white wheat for the marketing year to date are the Philippines at 617,000 metric tons, South Korea at 509,000 metric tons, Japan at 303,000 metric tons, China at 271,000 metric tons and Indonesia at 268,000 metric tons. Overall U.S. wheat export sales for the 2016-2017 marketing year that ended in May jumped 37 percent over the previous year, reflecting an improvement in the overseas market after two "tough" years, Bryant-Erdmann said in an email. Export sales so far in the 2017-2018 marketing year are off 1 percent from the same time last year. Pummeled by "significant headwinds from foreign exchange rate disadvantages, cheap ocean freight and large global wheat crops," U.S. wheat sales were 20.7 million metric tons during the 2015-16 marketing year, the lowest in the past five years, according to Bryant-Erdmann. U.S. Wheat Associates markets U.S.-grown wheat overseas. Export sales in 2016-2017 rebounded to 28.7 million metric tons, and USDA predicts 26.5 million metric tons in sales for the current marketing year, which would be in line with the five-year average. The marketing year runs from June to May. Bryant-Erdmann called the outlook for the rest of the marketing year "strong." "High-quality U.S. wheat will continue to be in demand," she said. USDA anticipates global wheat production to be lower in 2017-2018, but global wheat consumption will remain at last year's record high level. "With a smaller global wheat crop, milling quality becomes even more important," Bryant-Erdmann said. 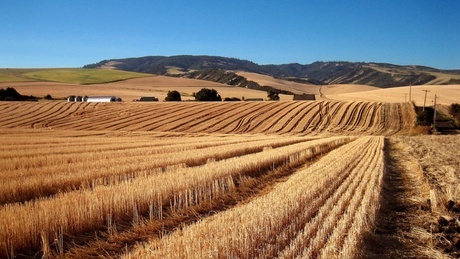 With the Northern Hemisphere's wheat crop in the bin, wheat production in the Southern Hemisphere, specifically Argentina and Australia, will be watched closely. Bryant-Erdmann said factors to watch for include weather impacts, planted areas, changes in the value of the U.S. dollar and the outcome of the North American Free Trade Agreement renegotiations.